Seismic activity was monitored on 22-24 April using one station located at 4,480 m elevation on the S flank. The station consisted of a 1-Hz vertical component seismometer, operating at 78 dB amplification with a band-pass filter between 0.3 and 30.0 Hz. The station registered five B-type events within a 5.5 hour time period on 23 April, and three events within 15 minutes of each other on 24 April. Coda duration was 10-18 seconds long; frequencies were in the 3-6 Hz range. Maximum peak-to-peak amplitudes measured 1-3 mm. Observers who ascended to the summit found no fumarolic activity. Crater morphology was unchanged since visits in October 1992 and 1989. Water discharge from the "La virgen" spring at 4,400 m elevation had decreased to 0.5 liters/hour from 10 liters/hour in 1992. Information Contacts: Guillermo González-Pomposo1 and Carlos Valdés-González, Departamento de Sismología y Volcanología, Instituto de Geofísica, UNAM, Cd. Universitaría, 04510 D.F., México; 1 Also at Benemérita Univ Autótonoma de Puebla, México. 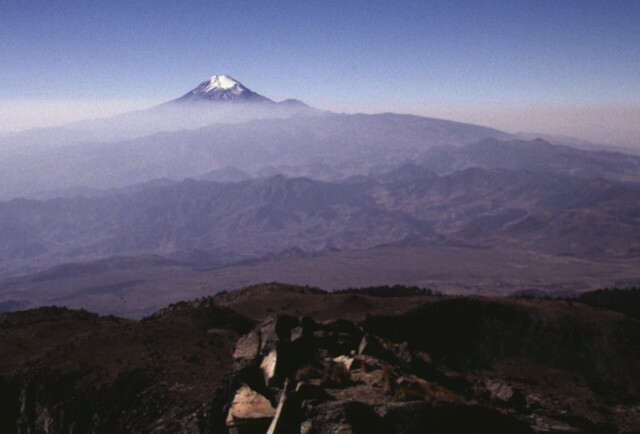 The Global Volcanism Program has no Weekly Reports available for Pico de Orizaba. During four days of seismic monitoring at Pico de Orizaba (10-13 October), only a single A-type event was recorded by an analog seismic station at 4,680 m above sea level on the S flank. The M 2.7 shock, on 12 October at 0124, had an S-P of 1.5 seconds, consistent with a depth of 8 km. The station, a 1-component (Z) 1-second seismometer, was operated at 72 dB amplification at 0.3-30 Hz. No fumarolic activity was observed and crater morphology has remained unchanged since the team's initial observation in 1989. Geologists plan a continued monitoring program. Information Contacts: G. Pomposo, Benemérita University, Puebla; A. Martín del Pozzo, UNAM, México D.F. 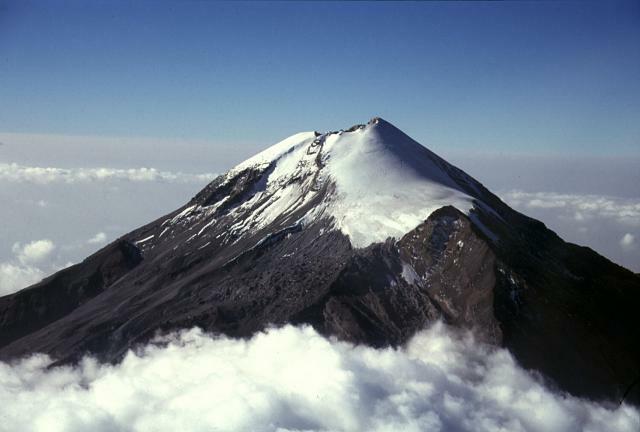 Pico de Orizaba (Volcán Citlaltépetl), México's highest peak and North America's highest volcano, was formed in three stages beginning during the mid-Pleistocene. Orizaba lies at the southern end of a volcanic chain extending north to Cofre de Perote volcano and towers up to 4400 m above its eastern base. Construction of the initial Torrecillas and Espolón de Oro volcanoes was contemporaneous with growth of Sierra Negra volcano on the SW flank and was followed by edifice collapses that produced voluminous debris avalanches and lahars. The modern volcano was constructed during the late Pleistocene and Holocene of viscous andesitic and dacitic lavas, forming the current steep-sided cone. Repetitive explosive eruptions beginning during the early Holocene accompanied lava dome growth and lava effusion. Historical eruptions have consisted of moderate explosive activity and the effusion of dacitic lava flows. The latest eruption occurred during the 19th century. Cantagrel J-M, Gourgaud A, Robin C, 1984. Repetitive mixing events and Holocene pyroclastic activity at Pico de Orizaba and Popocatepetl (Mexico). Bull Volcanol, 47: 735-748. Capra L, Macias J L, Scott K M, Abrams M, Garduno-Monroy V H, 2002. Debris avalanches and debris flows transformed from collapses in the Trans-Mexican Volcanic Belt, Mexico - behavior, and implications for hazard assessment. J. Volcanol. Geotherm. Res., 113: 81-110. Carrasco-Nunez G, 2000. Structure and proximal stratigraphy of Citlaltepetl volcano (Pico de Orizaba), Mexico. In; Delgado-Granados H, Aguirre-Diaz G J, Stock J M (eds), Cenozoic Tectonics and Volcanism of Mexico, Geol Soc Amer Spec Pap, 334: 247-262. Carrasco-Nunez G, 1997. Lava flow growth inferred from morphometric parameters: a case study of Citlaltepetl volcano, Mexico. Geol Mag, 134: 151-162. Carrasco-Nunez G, 1999. 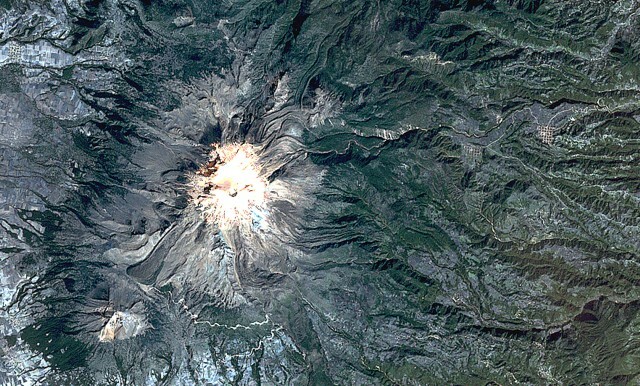 Holocene block-and-ash flows from summit dome activity of Citlaltepetl volcano, Eastern Mexico. J. Volcanol. Geotherm. Res., 88: 47-66. Carrasco-Nunez G, Ban M, 1994. Geologic map and structure sections of the Citlaltepetl volcano summit area, Mexico. Univ Nac Auton Mexico, Cartas Geologicas Mineras no. 9. Carrasco-Nunez G, Diaz-Castellon R, Siebert L, Hubbard B, Sheridan M F, Rodriguez S R, 2006. Multiple edifice-collapse events in the Eastern Mexican Volcanic Belt: the role of sloping substrate and implications for hazard assessment. J. Volcanol. Geotherm. Res., 158: 151-176. Carrasco-Nunez G, Gomez-Tuena A, 1997. Volcanogenic sedimentation around Citlaltepetl (Pico de Orizaba) volcano and surroundings, Veracruz, Mexico. In: Aguirre G J, Aranda J J, Carrasco G, Ferrari L (eds) Magmatism and tectonics of central and northwestern Mexico - a selection of the 1997 IAVCEI General Assembly excursions, Mexico, D F: UNAM, Inst Geol, p 131-151. Carrasco-Nunez G, Rose W I, 1995. Eruption of a major Holocene pyroclastic flow at Citlaltepetl volcano (Pico de Orizaba), Mexico, 8.5-9.0 ka. J. Volcanol. Geotherm. Res., 69: 197-215. Carrasco-Nunez G, Vallance J W, Rose W I, 1993. A voluminous avalanche-induced lahar from Citlaltepetl volcano, Mexico: implications for hazard assessments. J. Volcanol. Geotherm. Res., 59: 35-46. Crausaz W, 1993. 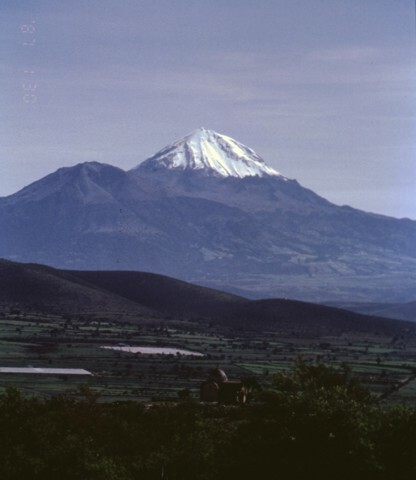 Pico de Orizaba or Citlaltepetl: geology, archaeology, history, natural history, and mountaineering routes. Amherst, Ohio: Geopress Internatl, 594 p.
De la Cruz-Reyna S, Carrasco-Nunez G, 2002. Probabilistic hazard analysis of Citlaltepetl (Pico de Orizaba) Volcano, eastern Mexican Volcanic Belt. J. Volcanol. Geotherm. Res., 113: 307-318. Gomez-Tuena A, Carrasco-Nunez G, 1999. Fragmentation, transport and deposition of a low-grade ignimbrite; the Citlaltepetl Ignimbrite, eastern Mexico. Bull Volcanol, 60: 448-464. Hoskuldsson A, Robin C, 1993. 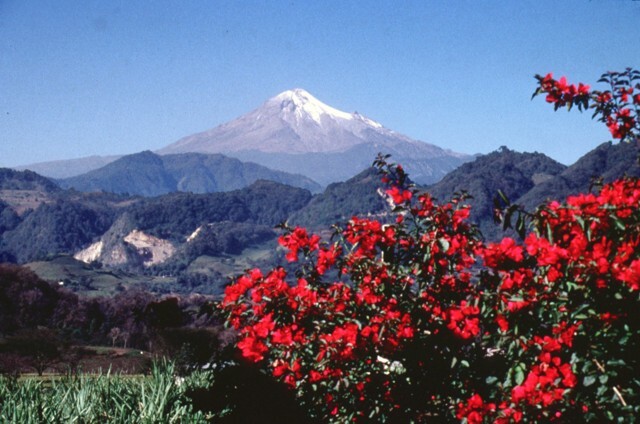 Late Pleistocene to Holocene eruptive activity of Pico de Orizaba, Eastern Mexico. Bull Volcanol, 55: 571-587. Luhr J F, Kimberly P G, Siebert L, Aranda-Gomez J J, Housh T B, Kysar Mattietti G, 2006. Quaternary volcanic rocks: insights from the MEXPET petrological and geochemical database. In: Siebe S, Macias J-L, Aguirre-Diaz G J (eds) Neogone-Quaternary continental margin volcanism: a perspective from Mexico, Geol Soc Amer Spec Pap, 402: 1-44. Mooser F, Meyer-Abich H, McBirney A R, 1958. Central America. Catalog of Active Volcanoes of the World and Solfatara Fields, Rome: IAVCEI, 6: 1-146. Robin C, Cantagrel J M, 1982. Le Pico de Orizaba (Mexique): structure et evolution d'un grand volcan andesitique complexe. Bull Volcanol, 45: 299-315. Rossotti A, Carrasco-Nunez G, Rosi M, Di Muro A, 2006. Eruptive dynamics of the "Citlalteptel Pumice" at Citlaltepetl volcano, eastern Mexico. J. Volcanol. Geotherm. Res., 158: 401-429. Schaaf P, Carrasco-Nunez G, 2010. Geochemical and isotopic profile of Pico de Orizaba (Citlaltepetl) volcano, Mexico: insights for magma generation processes . J. Volcanol. Geotherm. Res., 197: 108-122. Sheridan M F, Carrasco-Nunez G, Hubbard B E, Siebe C, Rodriguez-Elizarraraz S, 2001. Mapa de peligros del Volcan Citlalteptel (Pico de Orizaba). Inst Geog, Univ Nac Autonoma Mexico, 1:250,000 scale. Siebe C, Abrams M, Sheridan M F, 1993. Major Holocene block-and-ash fan at the western slope of ice-capped Pico de Orizaba volcano, Mexico: Implications for future hazards. J. Volcanol. Geotherm. Res., 59: 1-33. Siebe C, Macias J L, Abrams M, Rodriguez S, Castro R, 1997. Catastrophic prehistoric eruptions at Popocatepetl and Quaternary explosive volcanism in the Serdan-Oriental Basin, east-central Mexico. IAVCEI General Assembly, Puerto Vallarta, Mexico, January 19-24, 1997, Fieldtrip Guidebook, Excursion no 4, 88 p.
Zimbelman D R, Watters R J, Firth I R, Breit G N, Carrasco-Nunez G, 2004. 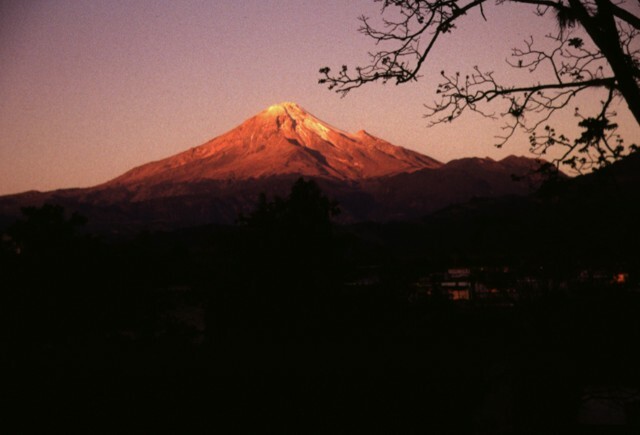 Stratovolcano stability assessment methods and results from Citlaltepetl, Mexico. Bull Volcanol, 66: 66-79. There is data available for 27 Holocene eruptive periods. There is no Deformation History data available for Pico de Orizaba. There is no Emissions History data available for Pico de Orizaba. These large hills on the outskirts of the city of Huatusco, 35 km from Orizaba, are part of the massive Jamapa debris-avalanche deposit, which covers an area of several hundred sq km. The avalanche was produced during the late Pleistocene by collapse of the northern side of Torrecillas volcano, a predecessor to Orizaba volcano, and created a 3.5-km-wide horseshoe-shaped caldera. The rapidly moving avalanche was able to ride up over a ridge into drainages that do not originate from Orizaba. Pico de Orizaba (Volcán Citlaltépetl), México's highest peak and North America's highest volcano, rises 4500 m above the Gulf of Mexico coastal plain. Its 5675-m-high summit contains a 500-m-wide, oval-shaped crater that is 300 m deep. It is seen here from the NNE with the Jamapa glacier at the right above the NW-flank peak of Sarcofago (right center). The present summit cone was constructed during the Holocene, overtopping previously collapsed edifices. The last eruption occurred during the 19th century. Photo by Gerardo Carrasco-Núñez, 1997 (Universidad Autónoma Nacional de México). Pico de Orizaba, also known as Citlaltépetl ("Mountain of the Star"), is México's highest volcano and North America's third highest peak. It is seen here from the south. The snow-free peak at the left is Sierra Negra, a 4580-m-high Pleistocene volcano that was active simultaneously with Orizaba. These volcanoes mark the southernmost extent of the Cofre de Perote-Pico de Orizaba volcanic chain. Photo by José Macías, 1996 (Universidad Nacional Autónoma de México). The evening sun reflects off the glacier-capped western flanks of Pico de Orizaba volcano. The knob on the left skyline is the NW-flank peak of Sarcofago. The NW-dipping lavas of Sarcofago, part of the second-generation Espolón de Oro edifice, were truncated by edifice collapse, forming a horseshoe-shaped caldera, inside which the modern cone was constructed. Photo by José Macías, 1995 (Universidad Nacional Autónoma de México). The N-S-trending Cofre de Perote-Pico de Orizaba volcanic chain is perpendicular to the trend of the Mexican Volcanic Belt. This view southward from the summit of Cofre de Perote towards glacier-capped Pico de Orizaba in the background shows two lesser known volcanic complexes in between. The La Gloria volcanic field, also known as the Desconocido-Tecomales volcanic field, forms the dissected area in the center of the photo, and Las Cumbres volcano is the broad range that extends from in front of Orizaba to the right-center horizon. Photo by Lee Siebert, 1998 (Smithsonian Institution). 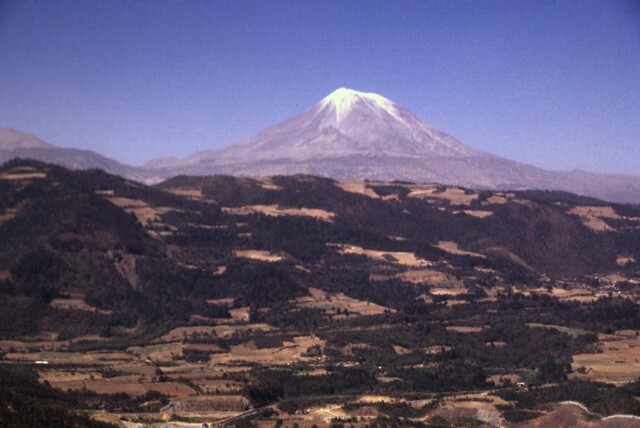 Pico de Orizaba (Citlaltépetl) volcano towers above ridges of Cretaceous limestone on its ENE flank. The glacier-clad volcano was constructed during three stages, and has undergone edifice collapse on several occasions. 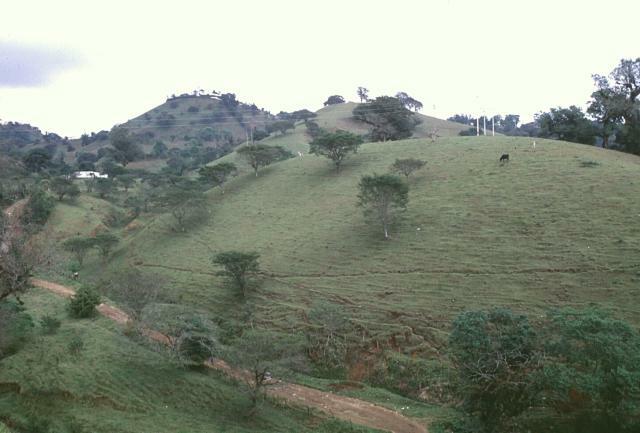 Collapse of the initial Torrecillas volcano during the Pleistocene produced the massive Jamapa debris avalanche. It traveled down the Jamapa river and overtopped gaps in limestone foothills to reach the current area of the city of Huatusco, beyond the location of this photo. Pico de Orizaba (Citlaltépetl) volcano rises above the escarpment at the eastern margin of the Mexican Altiplano. It is seen here from the SE, along the road between Puebla and Orizaba. Like other volcanoes of the Pico de Orizaba-Cofre de Perote chain, deposits of Orizaba are asymmetrically distributed around the summit vent, and extend farther to the east, in the direction of the lower-altitude coastal plain. The slopes of Sierra Negra volcano rise along the left-hand skyline above a saddle SW of Orizaba. A massive columnar jointed lava flow is exposed in a valley wall NE of Orizaba volcano. 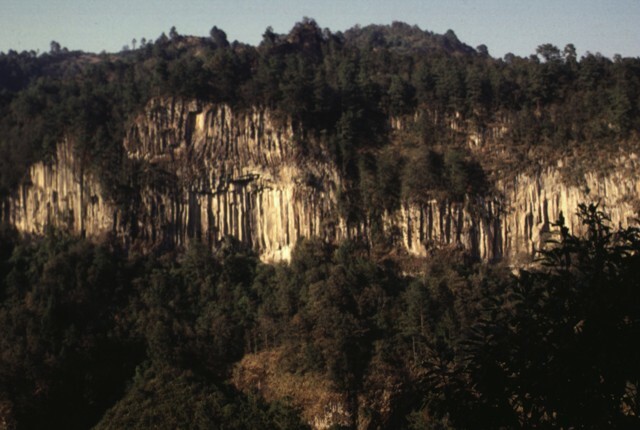 The roughly 530,000-year-old Calcahualco lava flow was erupted during the Torrecillas stage of the growth of Orizaba, the first of three major volcanic edifices forming the volcano. The source of this flow is now buried, but the flow may have originated from a flank vent. 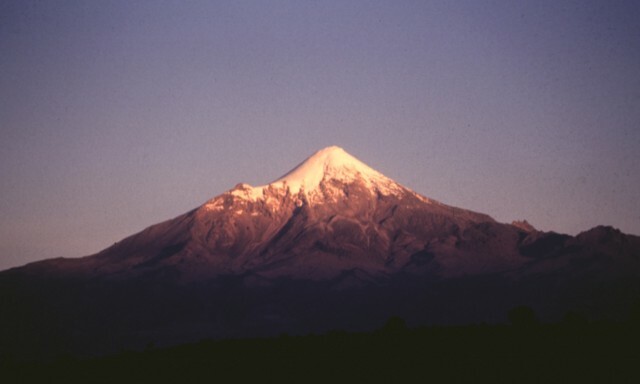 Like other volcanoes in the Cofre de Perote-Pico de Orizaba chain, Orizaba was constructed on the edge of the Altiplano and consequently has higher relief on the eastern side facing the Atlantic coastal plain. 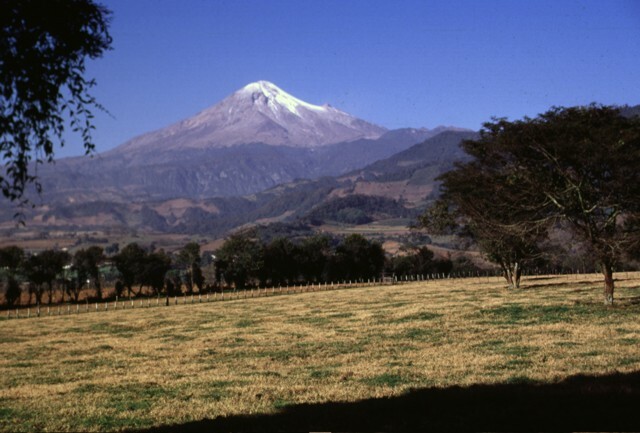 Glacier-capped Orizaba (Citlaltépetl) here towers 4200 m above fields near the town of Coscomatepec on its eastern flank. The valley to the left was affected by the voluminous clay-rich Tetelzingo debris avalanche and lahar during the late Pleistocene. Sunrise alpenglow brilliantly colors the eastern slopes of Pico de Orizaba volcano above the town of Calcahualco. The volcano is named for the city of Orizaba below its SE flank, but is also known by the Aztec name of Citlaltépetl (Star Mountain). The volcano has a rich cultural history. Its lower slopes host Aztec villages, pyramids, and temples. Its image adorns Aztec hieroglyphics and colonial and modern paintings, woodcuts, and lithographs. 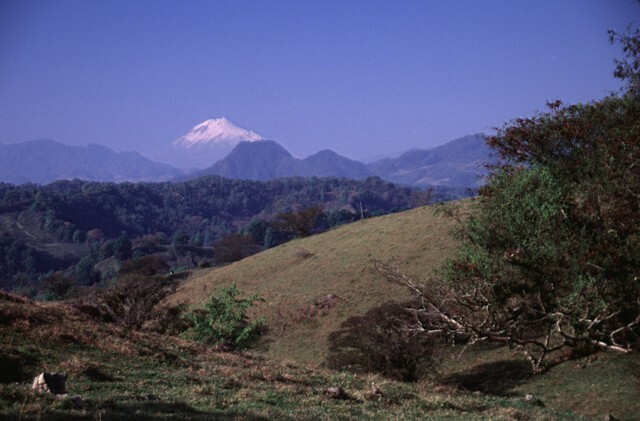 Ice-capped Pico de Orizaba volcano is seen here from the south, with snow-free Sierra Negra volcano to its left. Sierra Negra is the southernmost major vent of the roughly NNE-SSW-trending Pico de Orizaba-Cofre de Perote volcanic chain. The construction of Sierra Negra was contemporaneous with the mid-Pleistocene early stages in the formation of Orizaba volcano. Sierra Negra is composed of andesitic and basaltic-andesite lava flows and produced numerous pyroclastic flows distributed mainly SW and west of the volcano. México's highest volcano, Pico de Orizaba, is seen here in an aerial view from the SE. 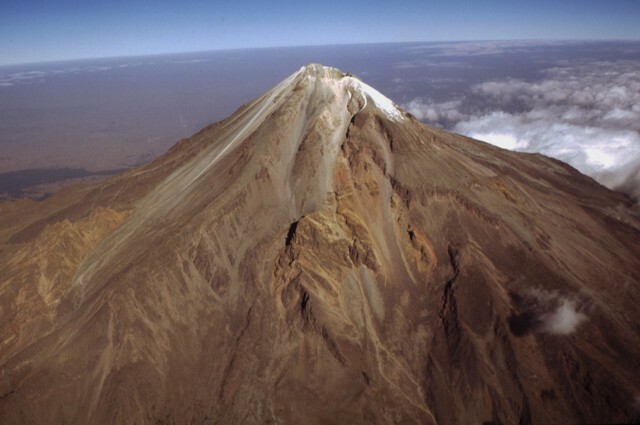 The modern Citlaltépetl cone, marking the upper part of the volcano, was constructed within horseshoe-shaped calderas formed by the collapse of previous edifices. 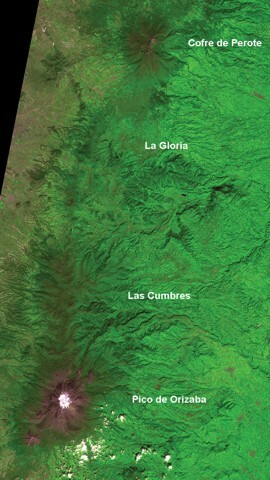 The orange-brown ridges at the middle left and and center are remnants of the oldest edifice, Torrecillas. The lighter-colored area between these two ridges is a thick, blocky historical dacitic lava flow erupted from the modern Citlaltépetl cone. Photo by Gerardo Carrasco-Núñez, 1997 (Universidad Nacional Autónoma de México). Glacier-clad Pico de Orizaba (Citlaltépetl) rises 50 km to the SW above rolling terain south of the town of Xico, on the lower slopes of Cofre de Perote volcano. European discovery of Orizaba took place in 1518, when the explorer Anton de Alaminos sailed along the coast of the Gulf of Mexico, and the following year, when Hernando Cortez passed over the Cofre de Perote-Pico de Orizaba range along the "Route of Cortez" between Veracruz and Mexico City. 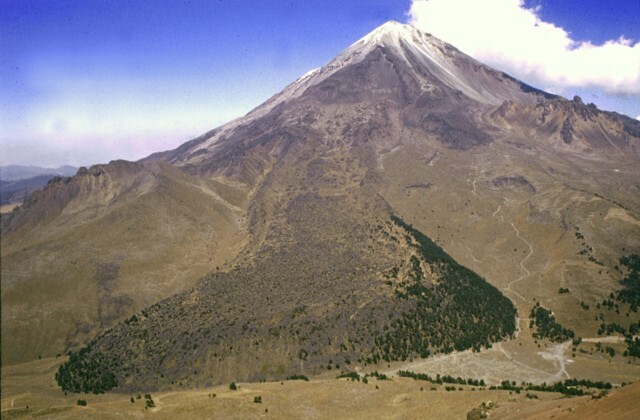 A blocky dacitic lava flow descended the SW flank of Pico de Orizaba (Citlaltépetl) in historical time. This lava flow is about 110 m thick and up to 1.3 km wide at its terminus, 5.5 km from the summit crater. The lava flow is a composite of at least 8 individual flow lobes. A portion of the flow that was diverted by topography to the west can be seen at the middle left flank. The small peak on the lower SW flank to the left of the lava flow is Cerro Colorado, a <90,000-year-old dacitic lava dome that produced pyroclastic flows to the west. 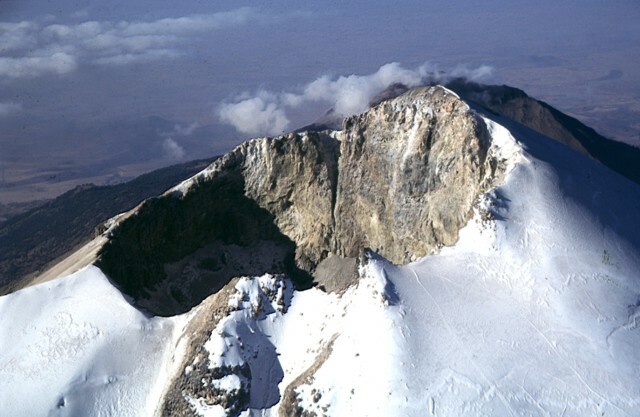 The steep-walled summit crater of Pico de Orizaba (Volcán Citlaltépetl) is 400 x 500 m wide. The crater floor lies 300 m below the summit on the NW side of the crater rim. Climbers' tracks can be seen on the Jamapa Glacier at the lower right, the standard climbing route on Mexico's highest volcano. The first climb of the volcano may have been by followers of the Toltec Indian leader Quetzalcoatl, who were said to bury him at the summit in about 1175 CE. Humboldt noted in 1804 that Mexicans obtained sulfur from the volcano. Pico de Orizaba (Volcán Citlaltépetl) was constructed on the edge of the Altiplano and has substantially higher relief on its eastern (right) side. Debris avalanches and lahars produced by edifice collapse have swept down the eastern flanks of the volcano onto the coastal plain. A prominent blocky dacitic lava flow with lateral levees is visible on the lower SW flank below the summit icecap. The eroded peak at the lower left beyond the lava flow terminus is 4580-m-high Sierra Negra, the southernmost peak of the Cofre de Perote-Orizaba volcanic chain. The 70-km-long NNE-SSW-trending Cofre de Perote-Pico de Orizaba chain is the easternmost of three volcanic chains perpendicular to the trend of the Mexican Volcanic Belt (MVB). 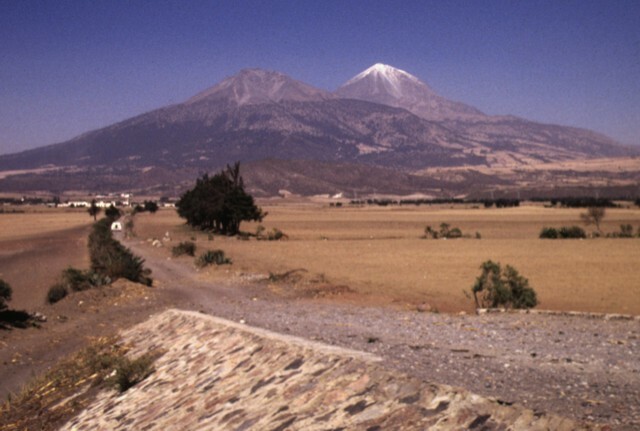 The andesitic-dacitic Cofre de Perote shield volcano and snow-capped Pico de Orizaba (Citlaltépetl) anchor the northern and southern ends of the chain, respectively. As with other transverse chains in the MVB, volcanism has migrated to the south, but here young satellitic cones of Pleistocene-to-Holocene age are scattered throughout the chain. ASTER satellite image, 2001 (National Aeronautical and Space Administration, processed by Doug Edmonds). Large Eruptions of Pico de Orizaba Information about large Quaternary eruptions (VEI >= 4) is cataloged in the Large Magnitude Explosive Volcanic Eruptions (LaMEVE) database of the Volcano Global Risk Identification and Analysis Project (VOGRIPA).